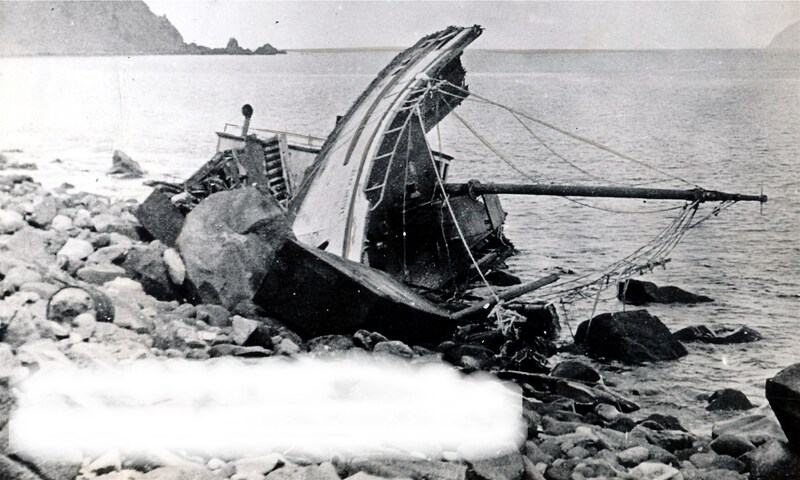 FISCHER BROTHERS (1900) The 76 foot wooden two masted schooner Fischer Brothers was blown onto a rock and lost several miles NW of Cape Rodney at 3:00 a.m. October 24, 1900. Weather at the time was reported to be “very heavy wind; sea extremely rough; dark night.” The eight crew and one passenger aboard the Fischer Brothers were assisted to the beach with a life line by several men on shore 6 or 8 hours after the wreck. A M Flagg, master of the vessel, died ashore several days later of hardship and exposure. There was no cargo aboard the Fischer Brothers but the vessel was a total loss worth $5,000. The last port of the Fischer Brothers is listed as Port Clarence with a destination of Seattle. Master of the Florence, Lincoln Archagra was lost, but the other two crewmen survived. The Florence had departed Nome October 17, 1905 bound for Unalakleet. The 15 employees and 7 crewmembers of the Florence made it to safety, but the fate of the Florence, valued at $15,000 was not good. At the time that the wreck report was filed they were unable to ascertain the total damage but figured the loss was probably total with no insurance. FLYER (1919) The 6 ton wooden scow Flyer was blown from her moorings, cast on shore, and broken up by the ice and water at 9:00 a.m. October 9, 1919 at the mouth of the Kiwalik River. There was no one aboard at the time and no cargo. The vessel was a total loss, valued at $500 and had no insurance. FORTUNE HUNTER (1898) The steam schooner Fortune Hunter and an unknown barge were found at sea by the steamer Tillamook “waterlogged and in unmanageable condition 55 miles from St Michael” in October of 1898. The Fortune Hunter and barge were towed to Golovin Bay and beached. The barge was lost along with one man.